Living in high elevation areas like Durango; we know that our homes are exposed to harsh elements. The sun beats on the exterior of our homes a little harder because of the higher altitude (closer proximity to sun). Not only that, but the snow that lives in our yard a quarter of the year causes moisture issues and magnifies sun that much more. If your once beautiful door could use a little tender loving care, maybe varnish is the answer. Varnish can not only make a dull-looking door look new by enhancing the color, but it can offer protection from rain, wind, snow and sun. 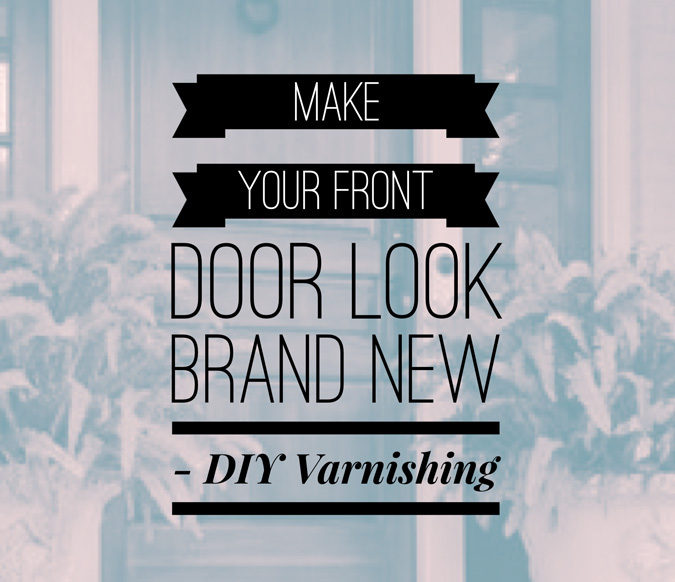 So take two minutes to learn how to varnish your front door yourself! Using a clean rag and a tiny bit of mineral spirits (enough to dampen the rag, but not leave it dripping wet), clean the door. A good method is to put the rag over the opening of the bottle and tilt the bottle to the side. Do this in three or four spots to make sure you have enough on the rag. Scuff sand the doors with a fine grit sanding sponge. This is just a light sanding by hand to remove defects in the coating and also help break down the previous coating to make the new coating adhere better. Touch up stain with an interior oil-based stain like Minwax Wiping Stain. Color does not have to be perfect. Cover any glass, door handles, threshold and surrounding trim/siding with masking paper or newspaper. Remove weather stripping (Usually pulls right off – if not, cover with tape). Clean the door again with a touch of mineral spirits and a rag. Spray a light coat of Minwax Spar Varnish Satin (I prefer the oil-based). Make sure the door is closed when spraying so additional protection is not necessary. Wait 2 hours or until the door is dry to the touch. Lightly sand the door to make it smooth. Clean sanding dust with a rag with a little mineral spirits once again. Special notes: If expecting weather or wind, you should wait to varnish or risk the appearance of debris in your finish.